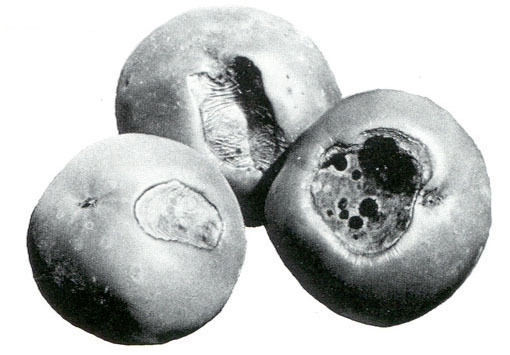 Symptoms may occur at any stage in the development of the fruit, but, most commonly, are first seen when the fruit is one-third to one-half full size. As the name of the disease implies, symptoms appear only at the blossom end of the fruit. Initially a small, water-soaked spot appears, which enlarges and darkens rapidly as the fruits develop. The spot may enlarge until it covers as much as onethird to one-half of the entire fruit surface, or the spot may remain small and superficial. Large lesions soon dry out and become flattened, black, and leathery in appearance and texture. This disease does not spread from plant to plant in the field, nor from fruit to fruit in transit. Since it is of a physiological nature, fungicides and insecticides are useless as control measures. The occurrence of the disease is dependent upon a number of environmental conditions, especially those that affect the supply of water and calcium in the developing fruits. Factors that influence the uptake of water and calcium by the plant have an effect on the incidence and severity of blossom end rot. The disease is especially prevalent when rapidly growing, succulent plants are exposed suddenly to a period of drought. When the roots fail to obtain sufficient water and calcium to be transported up to the rapidly developing fruits, the latter become rotted on their basal ends. Another common predisposing factor is cultivation too close to the plant; this practice destroys valuable roots, which take up water and minerals. Tomatoes planted in cold, heavy soils often have poorly developed root systems. Since they are unable to supply adequate amounts of water and nutrients to plants during times of stress, blossom end rot may result. Soils that contain excessive amounts of soluble salts may predispose tomatoes to the disease, for the availability of calcium to the plants decreases rapidly as total salts in the soil increase. Control of blossom end rot is dependent upon maintaining adequate supplies of moisture and calcium to the developing fruits. Tomatoes should not be excessively hardened nor too succulent when set in the field. They should be planted in welldrained, adequately aerated soils. Tomatoes planted early in cold soil are likely to develop blossom end rot on the first fruits, with the severity of the disease often subsiding on fruits set later. Thus, planting tomatoes in warmer soils helps to alleviate the problem. Irrigation must be sufficient to maintain a steady even growth rate of the plants. Mulching of the soil is often helpful in maintaining adequate supplies of soil water in times of moisture stress. When cultivation is necessary, it should not be too near the plants nor too deep, so that valuable feeder roots remain uninjured and viable. In home gardens, shading the plants is often helpful when hot, dry winds are blowing, and soil moisture is low. Use of fertilizer low in nitrogen, but high in superphosphate, such as 4-12-4 or 5-20-5, will do much to alleviate the problem of blossom end rot. In emergency situations, foliage can be sprayed with calcium chloride solutions. However, extreme caution must be exercised since calcium chloride can be phytotoxic if applied too frequently or in excessive amounts. Foliar treatment is not a substitute for proper treatment of the soil to maintain adequate supplies of water and calcium. Although differences exist among varieties with respect to susceptibility to blossom end rot, no varieties as yet have commercially useful resistance.